Sarah's Threads: Vanilla ice cream on 100' day! Vanilla ice cream on 100' day! It's going to be another 100' + day in Portland. 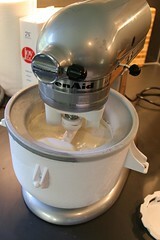 I woke up this morning early and decided to make some ice cream. My husband and I started it last night, but it had to chill for 8 hours. We used our new Kitchenaid attachment, which came with a recipe. Follow instructions on the instruction guide. You will have to have the freezer bowl frozen at least 12 hours and the mix will have to chill for 8 hours (at least) before going in the bowl. The days of the hand cranked ice cream are over! OMG that looks so easy. Can you add berries, you think? Or mini chocolate chips or something? ?